Thus far on Spontaneous Lunacy we’ve met a handful of artists who’d go on to make their names most prominently in the 1950’s and their early efforts recounted here were largely just preludes to their sustained runs of excellence after the turn of the decade. But in Ivory Joe Hunter we have someone who managed to excel (commercially AND artistically) in both the 40’s and the 50’s and thus became that rare figure, both a founder of the emerging style and a crossover star once that style became firmly entrenched on the national consciousness. Hunter was christened Ivory Joe at birth. It was not, as some would surmise, a later concoction to emphasize his piano skills dreamed up by some unscrupulous record exec. His parents were both musical and with more than a dozen siblings probably were running out of more traditional names to use by the time he popped into the world. Whether the moniker had any influence on what instrument the young Ivory Joe would find an affinity for or not, he was by all accounts already performing publicly by the time he hit puberty after both parents passed away and he needed to earn money to help out at home. His first official recording came in 1933 when folklorist Alan Lomax cut him singing “Stagolee” for the Library Of Congress transcriptions. By the next decade Hunter had gone from supporting himself with club work to making recordings, including for the first of two labels he started himself, named – no surprise – Ivory Records. 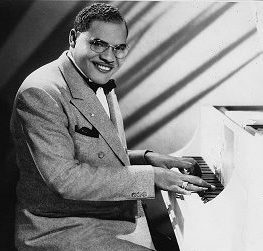 He had his first hit in 1945 with “Blues At Sunrise”, which went to #3 on the charts. The rest of his pre-King Records story will be delved into more in a future review where it’s more fitting but the short version is: Apparently frustrated with the hassles of overseeing his own label he signed on with independent powerhouse King Records as an artist and had his first session for them following Labor Day weekend, 1947, from which they pulled Don’t Be No Fool, Fool to make up one half of his first release. It was a bit of an odd choice though. That’s not to say it isn’t typical Hunter material or delivery. In fact it’s both. Despite his versatility he was at heart a mellow balladeer with a knack for warm melodies and lyrical introspection. At times he’d veer into almost pure white-bread pop territory, at others he’d hint at jazzier leanings and down the road he’d be the first to successfully bridge country and rock long before anyone in The Byrds were even playing an instrument outside of banging spoons on the pots and pans on their parents kitchen floors. Hunter could be an effective uptempo rocker when called upon, playing good boogie woogie piano, but he made his mark most often with this type of record – smooth, laid-back and classy. It’s just that usually the results were, well… a little more gripping than this. That’s why it was such an odd choice for a debut on a new label. One would think King Records would be looking for a record capable of making more of a giant splash to announce his arrival with their company and this song, like a pebble tossed into the ocean, wasn’t going to create so much as a ripple. Despite its rather stern sounding title Don’t Be No Fool, Fool is a decidedly mild, almost polite, verbal reprimand from Hunter to a woman he has some history with, employing the kind of tight-lipped restraint that arguing parents often adopt in front of their children so the kids won’t realize there’s even a fight going on. While that brand of censored dispute is appropriate for that setting, there are no kids here to worry about, not in the story and surely not listening to rock ‘n’ roll in 1947, so there’s no need to be so demure about it. If you’re going to recount the details of a crumbling relationship it’d be far better to focus on the words spewed when you’re behind closed doors and the gloves can come off. Musically it’s much the same, dressing up this reputed hostility in chiffon and lace, not wanting to let the neighbors get any idea of the turbulence going on behind the walls. Hunter’s piano carries the rhythm decently enough but never lets loose for any type of barrelhouse stomping the song cries out for. There’s nothing declarative about it in any sense, even with the great Ben Webster on saxophone, as the Duke Ellington sideman known affectionately as “The Brute” for his tough romping tones on the instrument chooses instead, or was directed by Hunter or an A&R man in the studio, to play very subdued, robbing the song of the vitality it desperately could’ve used. As a result there’s no contrast in the arrangement for it to stand out, no urgency, no emotion, no life to it all, and so it sort of just lays down and plays dead in the road, not bothering anybody, but requiring you to step over the corpse to go along your merry way. I don’t mean to make it seem awful, because it’s not. They play fairly well, but it’s just WHAT they play is not really captivating. Hunter’s piano work early on is reasonably effective, but the trumpet solo that follows in the break utterly kills the momentum from which the song never recovers. Here’s where we are morally (and legally) obligated to remind you once again that the trumpet’s prominence as an instrument was the last vestige from the pre-rock mindset before it was replaced by the more earthy tenor sax solo which would go on to define rock for more than a decade… and with Webster on hand why they chose not to emphasize him instead is beyond me. Where Hunter disappoints the most though is the marriage between the lyrics, which are an effective kiss-off to a woman, and the vocal delivery, which simply recounts the offenses in a rather bland, unaffected tone. While he chides her for her actions with his words he doesn’t convey that disgust with his voice. There’s no harshness, no sneering at her foolishness, no disdain for what it was that supposedly brought on this put-down in the first place. He’s taking the high road here I guess, which is good for his blood pressure, his reputation in the community and any future political ambitions he might have, but it’s not so good for the record’s appeal. Though scorned lovers turned vengeful are rarely welcome in society circles for obvious reasons, their harsh reactions to being dumped DO make for some exhilarating musical displays before they’re hauled off to the pokey for disturbing the peace, assault and battery and other acts of mayhem that usually result in restraining orders filed against them. But along with the criminal record that inevitably follows they often at least get a hit record to go with it! No chance of that here as Hunter sidesteps those troubling potential legal matters by being as bland as dry white toast. In the future this type of performance would be destined for album-filler. An underdeveloped throwaway type of song containing a few glimmers of his strengths here and there without them being fleshed out with a more well-conceived arrangement and a more appropriate delivery to emphasize the message. For an artist as significant as Hunter will wind up being this makes for a rather underwhelming introduction to him here on Spontaneous Lunacy, but I suppose it’s good that we don’t have to collect money to bail him out of jail if he really laid into this woman in the manner we’re (musically) advocating. Truthfully, that type of song, or more accurately the type of attitude required to really SELL this as a cutthroat song, really wasn’t in the owlish looking, though hulking (6’4”), Ivory Joe. The mellower style of rock he preferred was befitting his real life persona. He was by all accounts a nice guy, not a Wynonie Harris-type hell-raiser who’d publicly shame a woman in front of all his friends just for a laugh. So it’s probably appropriate then that Hunter conveys a man who was done wrong by his girl yet can’t bring himself to really get angry at her, perhaps even thinking deep down he deserved it, or at least that it was inevitable that a mild mannered guy such as he would be walked all over by a woman. In fact, that’s probably WHY she left him in the first place, the strong man she craved just wasn’t to be found in the gentleman (IE. a gentle man) she was stuck with, so she split. I suppose then it’s understandable that even when Hunter was telling off somebody who hurt him he’d pull his punches a bit. What’s less understandable though is why after it was laid down on wax the powers-that-be at King, notably Syd Nathan who ran his label with an iron fist, decided this was among the best bets for commercial success with their newest signee. Even if this was deemed by one and all to be far better than I’m judging it few would call it riveting or even particularly catchy and even its most ardent supporter couldn’t claim it had what it took to be a runaway hit and firmly establish Hunter’s presence as a star on the label. It didn’t do either of those things obviously. Unmemorable, if inoffensively pleasant, it never made a dent on the public’s consciousness and in fact it would take a convoluted set of circumstances to get his name back in the spotlight a few months down the road, but when it did Hunter ended up being one of the most consistently successful artists in rock as the 40’s wound down. You just wouldn’t have guessed it listening to this. 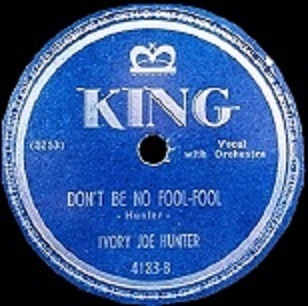 Leave a reply on "Ivory Joe Hunter: “Don’t Be No Fool, Fool”"